What They Say.....By the stroke of midnight, a heart would be broken, a cruel truth revealed, a devastating secret shared, and a love betrayed. 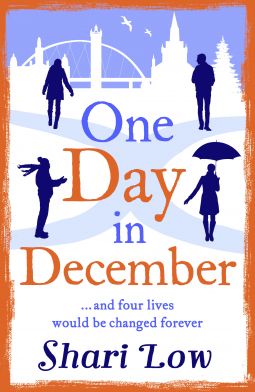 Four lives would be changed forever, One Day in December. Lila decided today would be the day that she told her lover's wife of their secret affair. What I Say....Oh the things that can happen in one day! And to so many people who don't even realize they are connected. I love Shari Low's books and one of the best things is how the characters reappear in different books. Cammy has been in trouble before, so I was hoping for good things for him, but geez, he really doesn't have great taste in women! Lila was horrible, but I still felt sorry for her because everyone could see what was coming a mile away, but when you are young and beautiful, you just don't think the rules of life apply to you. Following them all through the course of the day was a bit nerve wracking because you just knew the car wreck was coming and there was nothing you could do to stop it, and you certainly couldn't look away. But it's a Shari Low book, so the people who deserve a happy ending got one! Love her books!